When I mention my new personal best Grouse Grind time of 35:32 minutes (11th age and gender group) some people say “Oh, you are one of those people.” In 2009 I was just like everyone else, that year I decided to dedicate my training to one thing, getting faster on the Grind. Success didn’t come overnight, in 2009 I started with a time of 53 minutes (the average for my age group is 54:01). It all started because of a previous knee injury which I was concerned about going downhill with and an intense desire to be one of the fittest in my age group. Trail running was enjoyable, but usually there was some downhill involved. 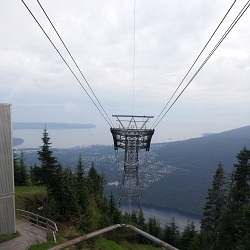 The Grouse Grind offered a tangible goal, a measurable method of comparing against my age group and it was all uphill, which I knew I was very good at. That year I set the crazy goal of a 35 minute Grouse Grind and a happy goal of sub 40 minutes. Despite the detractors, non-believers and the tremendous challenge I managed a 39:56 on my birthday of 2009! While seeing the mythical 35 minutes took until August 1st, 2012 to achieve; it wasn’t until this year that I really started to be able climb Grouse in under 40 minutes on a consistent basis. The Olympians have been inspirational. On Wednesday, I dug deep mentally and physically to take 1:15 min off my previous time set not too long ago. This momentarily amazed me, but then I realized that the human spirit and body can accomplish some phenomenal things when the chips are down. So what is next? Many people become unmotivated once a goal is achieved, mostly because they don’t have the next one in mind beforehand. I did. My audacious goal is 30 minutes, my happy goal is 33 minutes. These are performance measures, meaning that based on the last two years’ results 33 minutes would put me on the podium for the BMO Grouse Mountain Run while 30 minutes would place me among the fastest men who use the time card. Don’t defeat yourself before you start, thinking “I can’t do that! Whatever your goal is, make it personal and challenge yourself during each climb. Push yourself a little more each time you climb Grouse; keep thinking “Yes I can! Yes I can!” with each and every step. Remember to have a second goal in mind, because I know you can reach the first one. Humans have a large capacity for adaptation. Now go for it! If you enjoyed this post or found it inspirational please share it with others. I would also appreciate it if you would donate to the Grind for Kids fundraiser all proceeds go to the BC Children’s hospital. My goal is to raise $1,000 in 50 Grinds.